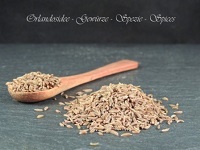 Caraway is the fruit of a least two year old wild growing Plant. Before the caraway plant reaches maturity the fruits will be cut off and hung to dry. Then it will be beaten to separate the seeds which is the caraway and dried under the sun. Its bitter, warm and lightly sweet taste completes a Chilly con Carne just the way you know it from vacations. Try caraway on an orange salad.